London Welsh have submitted a 43-page appeal against the decision to block their promotion to the Aviva Premiership ahead of this week's crucial hearing. The Exiles claimed this season's RFU Championship title with victory over Cornish Pirates last month but as things stand they will be denied the opportunity to step up from the second tier having failed to meet the minimum standards criteria laid down by the Professional Game Board (PGB) with Newcastle Falcons, who finished bottom of the Premiership, set to be saved from the drop. Independent auditors derailed London Welsh's promotion bid citing "various failures, including not having primacy of tenure at their nominated ground" - Oxford United FC's Kassam Stadium. However, London Welsh remain confident that they have met all the criteria in question, including the all-important ability to stage Premiership fixtures at any time required, having consulted with the RFU and Premier Rugby Limited (PRL) throughout the season. The appeal will be heard on June 28 by an independent panel compromising James Dingemans QC (chairman), Ian Mill QC and Tim Ward QC with London Welsh set to be represented by Pinsent Masons. A period of disclosure between the club, PRL and the RFU is already underway and as a result a swift judgement is expected following the hearing. London Welsh retain the right to appeal any decision with a possible High Court case looming if they are rebuked once again. It is also understood that Newcastle will be able to submit written representation to the panel although they will not be able to appeal any subsequent ruling. Last season, four Premiership clubs - Saracens, Sale Sharks, London Irish and London Wasps - operated under ground-share agreements with footbal club landlords and London Welsh's case is expected to be largely based on that apparent double-standard. The club are also expected to stress the suitability of the Kassam Stadium for top-flight rugby. 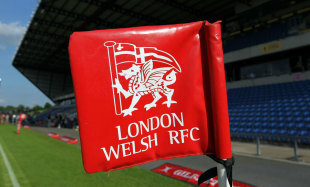 London Welsh, who will move their operation from their current Richmond base, are also confident of allaying fears over the availability of a back-up stadium and believe the other 'failures' do not warrant a block on promotion with regulations granting leeway to address these shortcomings or pay a fine - a luxury reportedly enjoyed by several existing Premiership clubs. London Welsh chairman Bleddyn Phillips recently revealed the club had received "overwhelming" support since their ascent to the Premiership was blocked: "This includes not only the general rugby supporting public, but more specifically owners and managers of Premiership clubs and other rugby clubs, as well as leaders of clubs in the Football League and other sporting institutions," he said. "These offers of help and encouragement extend not only to promises of financial and professional support, but also to offering up, in several cases, sporting venues as stadia where London Welsh might wish to play their 'home' games in 2012/13. We are most grateful for this, which to our mind underscores very sharply what we believe to be the fundamental issue at stake here. "Namely, that any team which demonstrates on the field of play that it has the requisite skills and resources to win through to the top of its division or playing group should be allowed to move on to the next tier, thereby upholding the competitive spirit of sport in general and the ethos of promotion and relegation on merit-based principles." With the new season a little over two months away, a speedy resolution would appear to be of paramount importance. London Welsh were included in the recent draw for the Amlin Challenge Cup as promotion would bring with it a place in Europe's second-tier competition while the fixtures for the new Premiership season are due to be announced on July 4. Planning, for both London Welsh and Newcastle, extends beyond their playing schedule with the Exiles unable to complete their playing squad for the new season due to question marks over their likely budget.